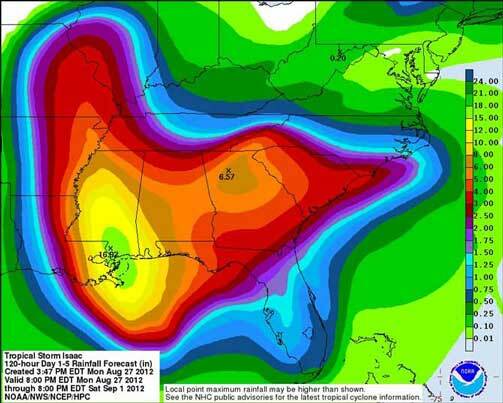 I’m noticing a boom in crazy-good satellite photos of Hurricane Isaac. They are full color, super-detailed, route and rain predictions, and (my favorite) cloud formations. I’m not sure why this is happening. Perhaps, it is the upgrade to our GOES weather satellites, or that the government has taken to social media like kids to water. Either way, I think it’s pretty cool and may end up helping out someone in harm’s way. Infrared imaging by JPL’s Cassini spacecraft has shown the existence of large methane lakes near the equator of Saturn’s moon Titan. One of them is about the size of Utah’s Great Salt Lake at its lowest recorded level and is at least three feet deep. The spacecraft also discovered smaller, shallower “ponds” nearby similar to marshes on Earth, with knee- to ankle-level depths. Astronomers have previously observed large methane lakes near Titan’s poles, but the discovery of the “tropical” lakes is a surprise because it was generally assumed that this region was too warm to allow such lakes to exist for any length of time. Titan’s weather system is similar to Earth’s in one respect, but with liquid methane instead of water. The methane near the equator evaporates and is transported by winds to the poles, where it condenses back into a liquid. …Like water vapor, which dissociates in the upper atmosphere to form ozone, methane is also dissociated by sunlight to produce reactive carbon atoms that can combine to form organic chemicals such as amino acids. Such compounds have been detected in Titan’s atmosphere and are the basis of some researchers’ speculation that Titan may harbor life forms of some sort.